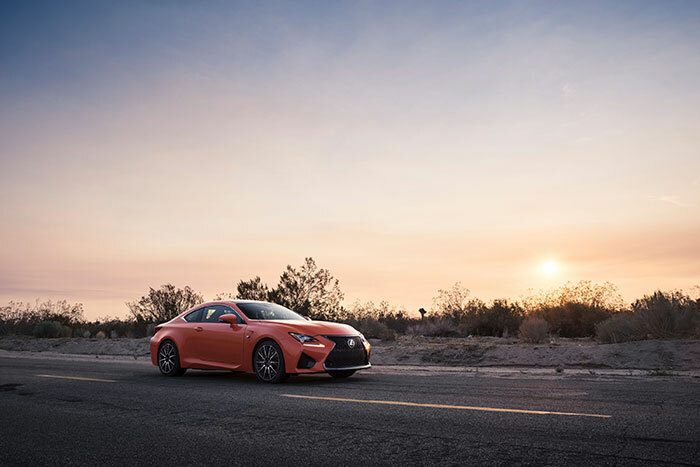 Lexus has unveiled the 2016 RC F and the car is aimed at the driver who wants a comfortable and luxurious car for the week and a car that can get it done at the racetrack on the weekend. The RC F packs a 5.0L V8 engine under the hood that makes 467hp and uses the Atkinson cycle when cruising around to improve fuel economy. The second the driver steps on the go pedal and performance is needed, the engine switches to the Otto cycle. Lexus fits the car with Active Sound Control to pipe sound into the interior of the car with an electronic control unit under the instrument panel that takes input from engine sounds including varying speed. That sound is augmented and piped back into the cabin for driver and passengers to hear. The V8 engine is mated to an 8-speed SPDS transmission that has user selectable modes including M mode that give clutchless manual shifting and automatic throttle blipping on downshifts. A driver controllable wing deploys from the trunk lid at 50mph to improve down force at speed. Lexus also fits the RC F with forged aluminum wheels and performance 19-inch tires. Pricing and availability are unannounced.